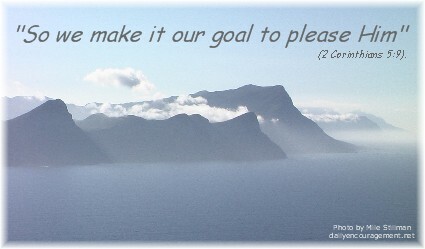 Message summary: A goal we should all have for the new year is to make it our goal to please the Lord! “So we make it our goal to please Him” (2 Corinthians 5:9). A new year is a time when many make goals, AKA resolutions. A new year signals the opportunity for a new start. Perhaps we can finally overcome that bad habit, whatever it may be. Perhaps we can consistently practice that good habit that’s been so elusive in our lives. There are a lot of goals we should make in life. The term “goal” is used a lot in sports but we also speak of financial goals, career goals, educational goals and many others. In a new year many Christians make goals regarding personal spiritual enrichment such as Bible reading, prayer, church attendance and so forth. Today we want to consider a vitally important goal we are to all have as Christians. It’s not a specific goal dealing with one area of life but rather a goal that is general but very guiding. The daily verse is a goal that the Apostle Paul had for both himself and his readers, notice the first person plural pronoun “we”. As part of the Holy Scriptures this includes us. It is one of the first verses of Scripture I memorized as a young man. “So we make it our goal to please Him.” That’s a great single phrase mission statement! By God’s grace it remains a simple expression of my outlook on life. The quest to find out what pleases the Lord is ongoing. Although God’s written revelation in the Bible regarding what pleases Him is unchangeable, new challenges in different contexts are always being set before us. Doing the right thing requires discernment and building a solid foundation so that you know that which He prohibits, and that which He finds pleasing. It is for our own good and for His glory. Daily prayer: Father, I make it my goal to please You in 2019. 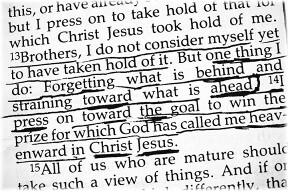 So many goals I make only last for a season, but when I set goals for righteous living the rewards will last not only for this life, but for all of eternity. In setting my goals help me to be willing to lay aside that which hinders and the sin that so easily entangles so that I can reap a future harvest of righteousness and peace. I want my primary goal to be that of perseverance so that no circumstances in this life will deter me from my eternal home. Amen. Resolved, never, henceforward, till I die, to act as if I were any way my own, but entirely and altogether God’s. Resolved, never to allow the least measure of any fretting or uneasiness at my father or mother. Resolved, (That) there be something of benevolence in all I speak.